Traveling in Europe shortly before World War II, the speaker’s grandfather captured three minutes of ordinary life in the small, predominantly Jewish town of Nasielsk. These few minutes of home movies have become a memorial to an entire community and culture annihilated in the Holocaust. Glenn Kurtz will show his grandfather’s film and present his own four-year search to locate survivors worldwide and reconstruct his grandfather’s town. Glenn Kurtz described his journey in Three Minutes in Poland: Discovering a Lost World in a 1938 Family Film, winning Best Book of 2014 awards from The New Yorker, The Boston Globe and National Public Radio. 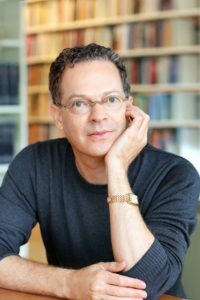 He is a Guggenheim Foundation Fellow and graduate of Tufts University, New England Conservatory of Music and Stanford University. Copies of Kurtz’ book will be available for purchase and signing. Download or print out our Year at a Glance Calendar.